Spring and Summer are "gee" seasons... golf, gardening, gliding, and ghost hunting. As the darkness sets in and you're done having fun for the day, wouldn't it be great to sit back and relax on your deck, dock or patio with a refreshing beverage, admire your surroundings and actually see your friends? Wimpy solar lighting (pictured left) won't cut it. You want (and deserve) light that is bright enough to see the whites of their eyes as you describe your latest adventures, in detail. Explore free-light. We have an extensive collection of solar lighting products to satisfy every need for free, renewable, light that looks great, installs in seconds, brightens for hours and lasts for years. Light up all the areas around your home, office, cottage or camp. 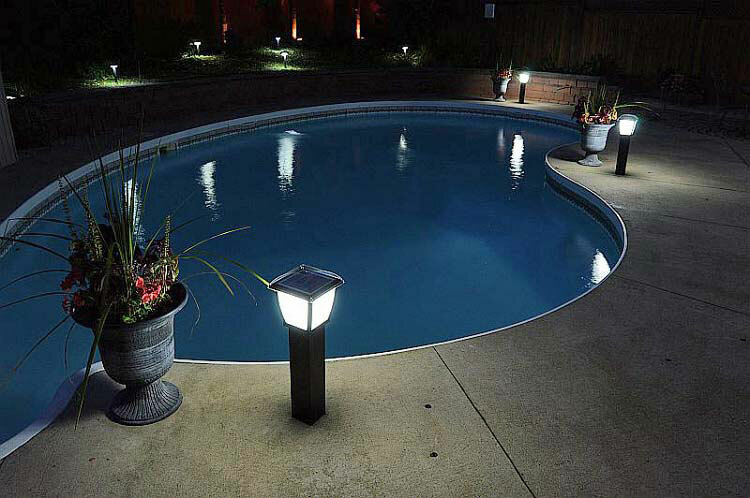 free-light solar lights are great for safety, security, and the illumination of walkways, pathways, tables, courtyards, patios, driveways, gardens, decks, fence posts, landscape uplighting, and stairs. no wires... just add sun!